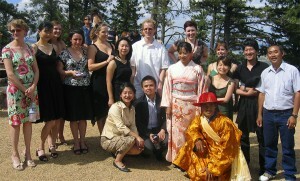 Last weekend, I traveled to Boulder, Colorado to go to the wedding of my dear friend Mariko. Mariko is Japanese; she married Pemba Sherpa who hails from Nepal originally. The wedding was at an outdoor ampitheater; 2 Buddhist monks officiated (1 Zen Buddhist for Mariko, the other Tibetan Buddhist for Pemba). It was quite an experience. 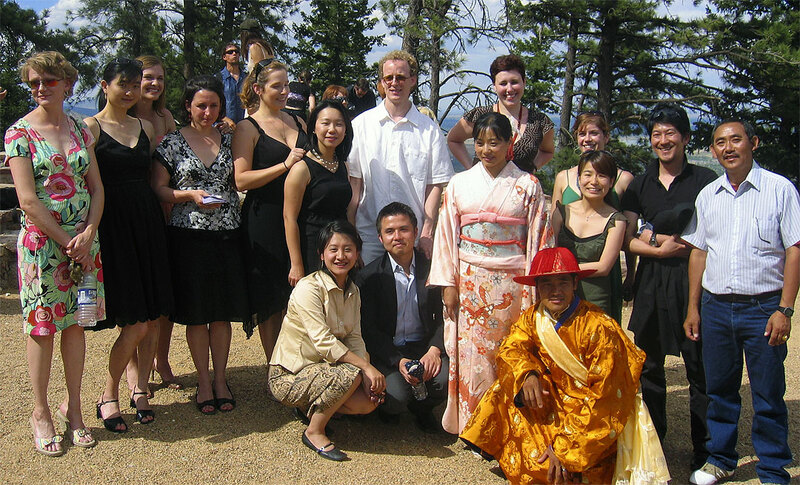 Everything made this wedding celebration completely unique–the gorgeous traditional robes & kimonos, the sake pouring & drinking, the crazy singing/drinking Sherpas, the beautiful Colorado day, and the old friends. The whole event turned into a mini-reunion for UPenn LARP graduates; the first in almost 3 years. Now that things have returned to normal, and I’ve settled back into my Myrtle Beach routine, I miss them all again. I think Caitlin should get married ASAP, so we can all meet up again! wait for me please, i take my bag, jump in my magic bubble and arrive. I do want to come to the rewedding..i’ll bring champagne from France. The man standing on the far right was stepping in for Hiroshi Hatai, who is a bit camera shy.